Never send for whom the budget tolls, it tolls for thee: an open letter Part II. The sixty years between World War II and September 11, 2001 were unparalleled for discovery and innovation even though they were fueled by fear. First, fear of Japan, Germany, and later Russia. After the war was over, a new ominous threat emerged that (in the eyes of most) threatened our future as a country if not defeated, communism. ‘Necessity breeds invention’ sure was true during the Cold War and our Research & Development infrastructure became the envy of other countries. On the tragic day 2,977 innocent lives died, our nation changed. We awoke to a new, hidden enemy with no country boundaries. It brought us together like nothing before. We were united. But some quickly turned to ideology and misinformation leading us into constant military offenses with no real way to fund them. One of the first schemes was by increasing the maximum allowable interest rate of student loans. Personally, mine went from 2% to 6% overnight. 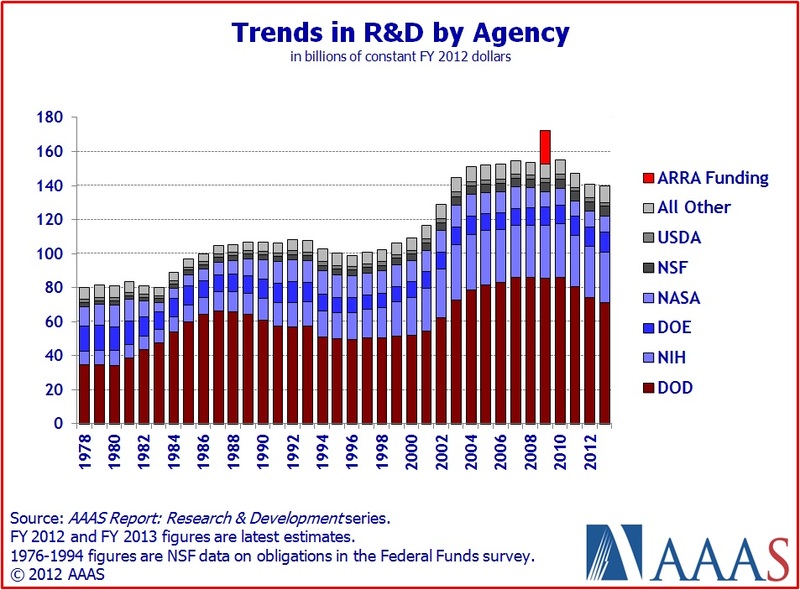 R&D spending initially rose after 2001. However, this is due to mostly an increase in Defense Department R&D budget increases. Later on, other sources were needed to continue funding war campaigns. Although most of this funding was borrowed against our future generations, the rest came from discretionary spending. One of the major spending bills is that for science R&D and energy R&D. When the Human Genome Project was completed in April 2003, America’s largest scientific spending project in history was over. Instead of using these funds for other science and technology programs, no other big science project has ever come to fruition (the Spallation Neutron Source began construction prior to 9-11-01). There’s more money for wars than medical research and basic science. Always has been. Imagine if it were the other way around…. My personal version of Utopia? Heh, a world where I’m always and forever more learning about myself and re-creating rather than destroying myself? You bet; I’m in. I’ll buy the first beer this time, Erik. Previous PostPrevious Never send to know for whom the budget tolls, it tolls for thee: an open letter Part I. Next PostNext Never send for whom the budget tolls, it tolls for thee: an open letter Part III.